Rep. Karen Bass delivered remarks on the House floor honoring his legacy. 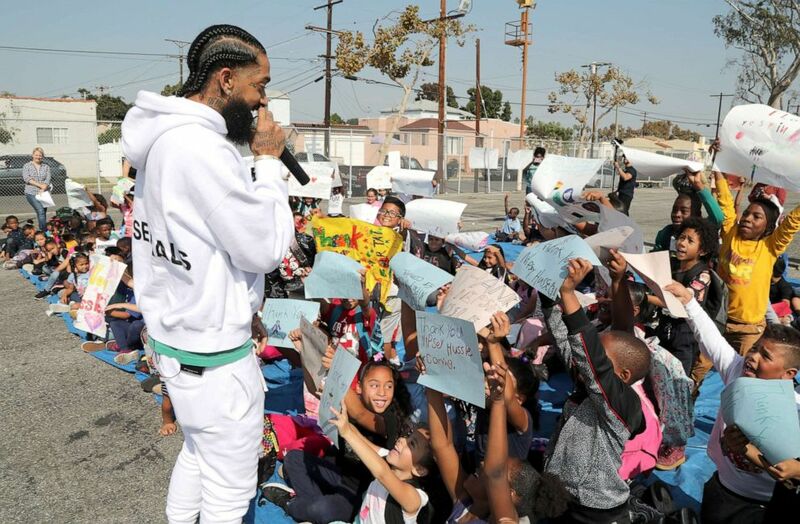 Nipsey Hussle's contributions to his community in South Los Angeles are now archived in U.S. history as part of the Congressional Record. Democratic Rep. Karen Bass, who represents Nipsey's neighborhood in California's 37th Congressional District, submitted the rapper's legacy into the record Wednesday morning. "Madame Speaker, I rise today on the floor of the House of Representatives to formally recognize and honor the legacy of Ermias Asghedom, known to his community and the neighborhoods of South Los Angeles and beyond, as Nipsey Hussle," Bass said on the House floor. Nipsey Hussle's legacy is now forever archived in U.S. history as part of the Congressional Record. "For all he was given, he gave back. And for that legacy, South Los Angeles has been changed forever," @RepKarenBass says. "He taught and reminded our community that the power we hold is the power we come from and that awareness of our power is something no one can take from us. Nipsey Hussle will be remembered as a visionary, as a protector, as an inspiration, as a philanthropist, as a father, as a brother and as an unabashed son of South Los Angeles. For all he was given, he gave back. And for that legacy, South Los Angeles has been changed forever." "I think a good way to honor Nipsey’s legacy is to create more economic opportunity for the neighborhoods," Bass said in an interview with ABC News last week. "Nipsey was always pushing for economic empowerment and entrepreneurship. Nipsey wanted to make sure that people from the community who were invested in the community were at the table when decisions about opportunity are being made. It’s about the empowerment that comes from that. It’d be a shame if the community was not a part of that investment and he knew that and acted on that." (Jerritt Clark/Getty Images, FILE) Nipsey Hussle speaks to kids at the Nipsey Hussle x PUMA Hoops Basketball Court Refurbishment Reveal event, Oct. 22, 2018, in Los Angeles. The Grammy-nominated rapper was an artist, an entrepreneur and an activist who was deeply involved in his community in Los Angeles. He was shot multiple times in the head and torso on March 31, while standing outside of his Marathon Clothing store near the Crenshaw district, where he grew up. He was rushed to a local hospital, where he later died. He was 33. He had two children, Emani and Kross, with his girlfriend Lauren London. As the news broke about his death, messages of disbelief and condolences poured in on social media, lauding Nipsey's entrepreneurial spirit and his investment and dedication to his own community in South Los Angeles. Eric Holder, the shooting suspect, was charged with one count of murder, two counts of attempted murder and one count of possession of a firearm by a felon in connection with the shooting, the Los Angeles County District Attorney's Office said on Thursday. Los Angeles City Council member Marqueece Harris-Dawson announced on Tuesday that next week he will submit a motion to name the intersection of Crenshaw Boulevard and West Slauson Avenue, where the rapper was gunned down, as "Ermias 'Nipsey Hussle' Asghedom Square." The announcement came after a Change.org petition generated nearly half a million signatures. People always asked him, "Why do you have something in this area? Why don’t you leave and do something else?" his older brother. Samiel Asghedom, told ABC News in an emotional interview last week, "but he was murdered while he was in a parking lot, hanging out, selling CDs and that’s the area that he felt attached to and did everything in the area and ended up buying a lot and rehabilitating, opening up businesses and just became a landmark for everybody. "He pulled himself from his boot strings, laying roots through everything -- police problems, as a black male trying to grow up and be enterprising, we face a lot of things in the community, you know, the politics within the hood, just hate. He transcended everything and just stayed there and became a beacon of light," Asghedom added. 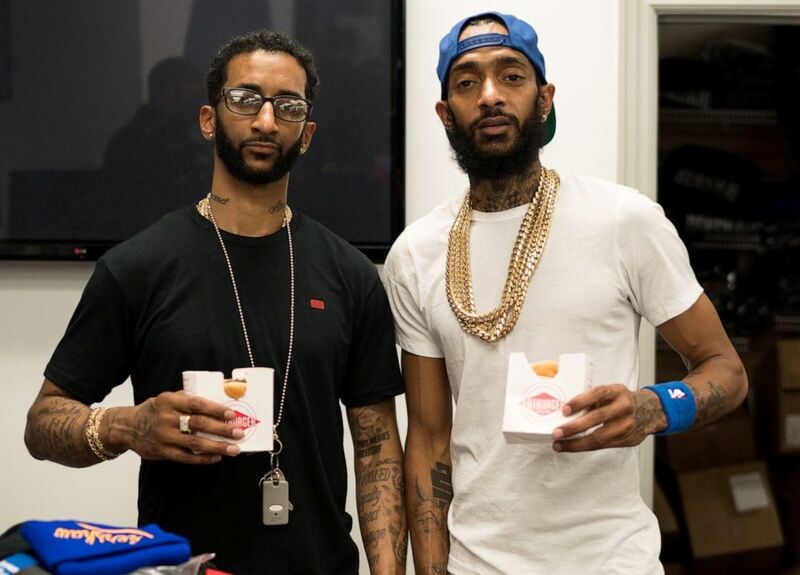 (Courtesy of Karen Civil) Nipsey Hussle and his brother, Samiel Asghedom. According to his brother, Hussle owned many businesses in his neighborhood, including Marathon Clothing, the co-working space Vector 90, Steve’s Barbershop, a cell phone shop, several restaurants, Marathon Studios and his own record label, "All Money In Records," a name that, according to his friend and his business partner Karen Civil, represents his belief in "keeping the money inside of the community." "You lead by example and he did that with the way he taught you about understanding entrepreneurship, business, understanding black capital, creating value, owning real estate ... that's what he called 'husslenomics,'" Civil told ABC News in a phone interview last Wednesday. "When he went to the studio it was his studio, when he went somewhere to eat, it was his business, when he went to get a haircut, it was his shop. He took ownership, he was very serious and he wanted to break the cycle that we cannot own, that we cannot provide." Nipsey, who had spoken publicly about his involvement with the Rollin' 60s gang, one of the biggest Crip gangs in Los Angeles, was an advocate against gun violence. He addressed the issue in his music. He was also scheduled to meet with the city's police chief and the president of the police commission last week to discuss ways he could help prevent children from getting involved in gangs. "Nipsey Hussle used the platform he created with his music to lift our community as he climbed," Bass said in her remarks on the House floor Wednesday. "His business ventures, his investments, his philanthropy, his community engagement -- every step of the way, he had a sole purpose of bettering the community he came from. A humble visionary, he saw the overlooked and welcomed the dismissed. He reminded our community that the power we hold is the power of where we come from and that the awareness of that power can never be taken from us." The congresswoman announced her intentions to honor Nispey last week, generating applause and gratitude from fans and artists alike. I will be heading to the House Floor next week to formally enter Nipsey Hussle’s contributions to South Los Angeles into the Congressional Record where it will be a part of United States history forever. Bass' submission of the Congressional Record comes a day ahead of the rapper's funeral, which is set to take place on Thursday at the Staples Center in Los Angeles.